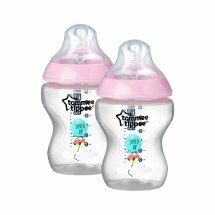 Tommee Tippee Decorated Bottles 0m+ - 2 CT.
Tommee Tippee�� Decorated Bottles 0m+. For natural latch and smooth transition from breast to bottle. 9 fl oz / 260 ml. Bottle feeding should be a relaxed and happy experience for you and your baby.